We think the climate change strike is important because it’s a huge problem. The Earth is already too hot, with droughts in winter in NSW and the coral reef is dying. I would like our politicians to acknowledge climate change is an emergency and take the necessary steps in order to have a sustainable world. We can’t vote, we’re too young to vote but you (politicians) are making decisions that affect us, so we want you to listen to us and hear our concerns and be our voice. This talk will cover practical steps you can take with garden design, retrofitting your house, and community engagement that will assist in fire disaster resilience. This session features popular permaculture designer David Holmgren and community fire expert from Kinglake, Daryl Taylor. The talks will focus on positive steps that you can take to prepare for the fire season. David will talk about what can be done around the home, including landscaping and retro-fitting to assist the protection of property. Daryl will focus on what practical steps that our community can take that will assist in our resilience. David Holmgren is the co-Designer of Permaculture and has a long connection to Fryers Forest in Fryerstown. RetroSuburbia is his latest book that, put simply, looks at ways to live sustainably and resiliently into the future. Daryl Taylor and his family survived the Black Saturday firestorm. His focus now is very much on the cultivation of personal, household, neighbourhood and community preparedness/resilience in relation to risks and threats of all kinds. 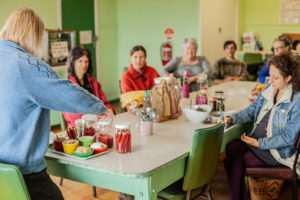 Daryl was an elected member of the Kinglake Ranges Community Recovery/Resilience Committee and the Convenor of the Combined Community Recovery Committees of Victoria. He is preparing a forthcoming book on place-based and community-led disaster preparedness. 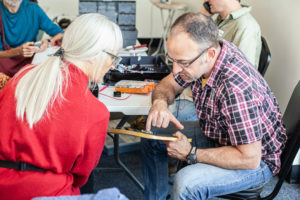 Daylesford’s Repair Cafe got off to an enthusiastic start in October with local fixers and supporters applying their skills to repairing items ranging from toasters to whipper-snippers to bicycles to clothes to cordless drills, as well as a good number of tools and knives being sharpened. With all items being weighed, the cafe stopped 63 kilos of repairable items being added to landfill. Held on the third Sunday of each month, come along to the next Repair Cafe on November 18th, from 1pm to 4pm at the Pavillion, Victoria Park. Learn and exchange skills, meet with other locals concerned to reduce our waste, and share a cuppa, cake and conversation. For further information contact Danny Kinnear on 0488 604 231 or Nikki Marshall on 0432 232 073. 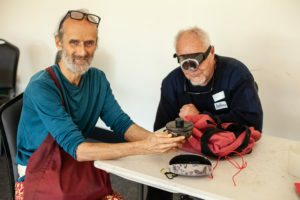 Castlemaine’s Repair Cafe goes from strength to strength and Chris has generously shared their learnings to help with the set up of Daylesford’s Cafe. Castlemaine will be moving to the Town Hall next year. 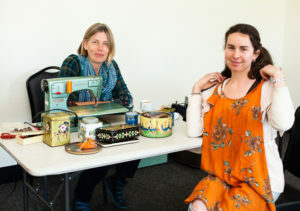 No Repair Cafes in December but both will open again in January. Central Victorian students who went on strike in early November have struck a nerve as news of the strike hit the front page of the Bendigo Advertiser and spread nationally (The Age, Sydney Morning Herald) and internationally (Geographica UK). A group of 30 + mostly Castlemaine primary and secondary students tried to meet with Senator Bridget McKenzie on Thursday without avail. Senator McKenzie’s staff would not address the concerns of the students or meet with them. They did allow a small delegation to write to the Senator. The students spent their striking time painting a large banner and chalking climate emergency and environment messages on the mall footpath. 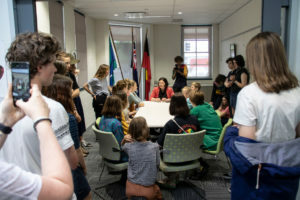 Later that day they received a different reception at Lisa Chester’s office (Federal member for Bendigo) who invited the 50 students into her (now crowded) office for a full discussion which lasted for nearly one hour. She promised to take their concerns to Canberra and seemed genuinely moved by the striker’s knowledge, passion and commitment. 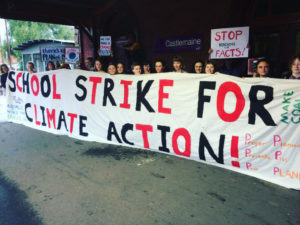 As a response to the Bendigo Strike, students across Australia are planning their own strikes with news of students in Sydney, Cairns, Hobart, Adelaide, Perth and regional centres taking up the idea. 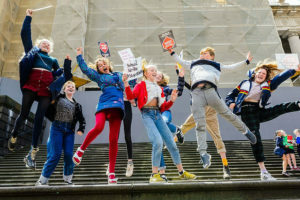 A national school student strike has been called for November 30th and already word is spreading that a large contingent of students from Central Victorian Schools are keen to attend in Melbourne. For more details see schoolstike4climate. We’re the only Aussie kids who are striking much more than just on the 30th November, which makes us pretty determined ! We would like to keep that up and hopefully inspire more kids to get out of school and strike before going the National day of school strike on Friday 30th November. On their second day of striking, the Aussie teens visited Labor Bendigo MP Lisa Chesters’ office with at least 50 others, all aged between 10 and 18. 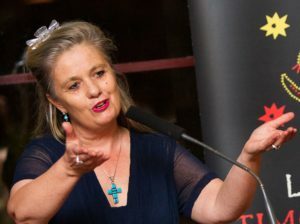 “I first felt that level of frustration – ‘the decisions you’re making in Canberra will affect us the longest because we’re the children’,” Ms Chesters told AAP. The group named inaction on climate change, the use of plastics, clean energy, deforestation and the proposed Adani coalmine as their top concerns. Ms Chesters will relay their message to the next Labor partyroom meeting and speak up in the House of Representatives when parliament resumes on November 26. “When people take strike action, when they stop doing something, that’s quite serious and that takes guts,” she said. Ms Chesters was struck by their focus on environmental issues while not siding with any political party and feeling disenchanted by party politics. “They’re wanting to vote, they’re wanting to have a say. There was a real sense that our democracy isn’t working,” she said. 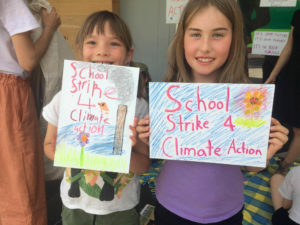 Events to organise school strikes for climate action towards the end of November are springing up on Facebook. Hundreds of students have indicated they want to attend protests outside state parliaments in the capital cities on 28, 29 and 30 November. Central Vic Climate Action encourages adults to support the young people on strike for climate change. The Letter Writing Cafe recommences this Friday morning and thereafter every 2nd and 4th Friday morning. Let our politicians, and the media, know what you think and how you feel. What: Who lives in the Wombat Forest? A short presentation on the amazing wildlife and threatened species of the Wombat Forest (located between Woodend and Daylesford). Gayle Osborne will speak on ‘Citizen science with motion-sensing cameras’. Wombat Forestcare has spent years learning about, promoting and protecting this stunning forest. 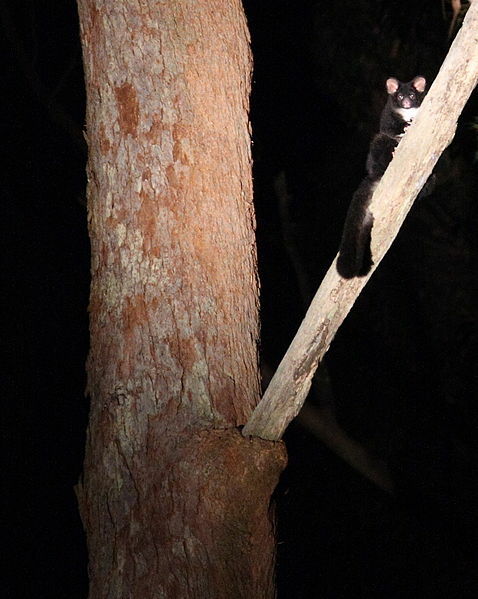 The group has used camera traps and spotlighting techniques to map populations of beautiful and endangered Greater Gliders, Powerful Owls and more. Using this information, Wombat Forestcare members have worked incredibly hard to protect the forest into the future, including gaining assessment as a potential National Park. The Victorian Environmental Assessment Council’s (VEAC) Central West Investigation just released a Draft Proposal report. New protection of public land has been recommended for Wombat forest (near Daylesford), Wellsford (near Bendigo), Mount Cole and Pyrenees Range forests (near Beaufort and Avoca) and dozens of smaller public parcels in the investigation area. This is a great opportunity to protect this land and its wildlife. VEAC seeks community submissions regarding the proposal. Coming along, learn about the forest, and write a quick submission on the night if you wish. Tea and cake and chat provided. All welcome! To download the event poster, click here. To read about Greater Gliders in the news, click here. Daylesford’s local storyteller Anne E Stewart is working on a project to tell the diverse stories of the people living within Hepburn Shire. 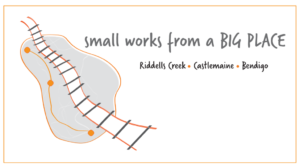 The Cicada aims to collect and record the personal stories of the Hepburn Shire community. The range of stories we have had so far has been incredible. Some of the stories have been humorous. It doesn’t matter what type of story it is, as long as it is in keeping with the theme and tells the story of a journey a person has been on, said Anne E.
Each story slam focuses on a different theme, with storytellers being given five minutes to share a personal story in an engaging way, without notes or props. The themes for the eight different story slam events highlight the diversity of the people who live within the shire. The Cicada story slams will culminate in a grand finale where heat winners vie to take home the Rodney Maurice May Storytelling Trophy. The thing we wanted to do was to chronicle the history of the Hepburn Shire. The main thing is to get people to tell stories locally so we can record and collect them to develop a sense of community that can sometimes get lost in a tourist town. All stories are being recorded for a podcast which will be broadcast on Hepburn Community Radio. Where: Senior Citizens Centre, Mechanics St, Castlemaine. How renewable energy totally transformed a Bavarian village. This presentation will tell their story and highlight where their lessons might apply to Mt Alexander Shire. There will also be a brief walk through the streets of one of the worlds greenest most sustainable suburbs. Deane Belfield is the presenter. 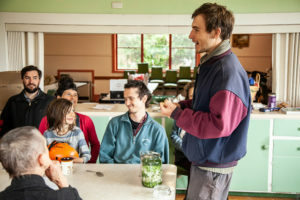 He is a Castlemaine sustainability advisor, bio-energy engineer and regenerative agriculture farmer – with a passion for “doing more with less”. In recent times he has visited a number of renewable energy communities and operations in Europe, North America and South America and is motivated by working with nature rather than against it. He strongly promotes the opportunity and need for regional communities and businesses to embrace circular economy thinking and transition to a Zero Net Emission, Zero Waste future. There will be a simple meal available at $5 a plate, with vegan and gluten free options. Drinks will be at bar prices. RSVP by Monday 19 November by email to info@masg.org.au or phone the office on 5470 6978. A gathering to celebrate the exhibition, the visual artists and the fabulous contribution creative communities make in Mount Alexander, Macedon and Bendigo. It is an opportunity for creatives to network and forge greater connections. Talking Fire, a local initiative designed to create different kinds of community conversations about fire, invites you to two events on 29 & 30 November. Come and hear Scott Falconer (Assistant Chief Fire Officer with FFMVic) share his experience in the United States and Canada where he explored the involvement of Indigenous people in land and fire management, with a focus on how Traditional Owners are working with agencies to reintroduce cultural burning to Country, establishing strong relationships with Traditional Owners and creating employment opportunities. Scott’s research was supported through The Lord Mayor’s Bushfire Appeal Churchill Fellowship. He was accompanied by Trent Nelson, Dja Dja Wurrung man and Parks Victoria Ranger Team Leader for part of the research trip. Read more here . All welcome. Free event but please book your place by Monday 26 November via Eventbrite. At this one-day event we will discuss how we can connect Indigenous fire traditions with current approaches to fuel reduction and planned burns to shape new ways to protect our landscape and communities. For more information go to Talking Fire on Facebook or our website or drop us a line at newsteadtalkingfire@gmail.com. Read more about the 2016 Talking Fire event. After an inspiring sharing of ideas, recipes, experiments, successes, failures, stories, microbes and our love for the alchemy of life on the first Saturday in November, the next Culture club will focus on miso making. Thanks to Mara Ripani for beautiful photos of November’s favourite ferments. CALL FOR ABSTRACTS FOR BOOK CHAPTERS: Food for Degrowth: Principles, Case Studies and Challenges. How can we produce, consume and preserve food for degrowth in urban settings? To what extent is urban food sufficiency and resilience possible? How can we redesign food provisioning in cities and towns to overcome current limitations? Understanding food for degrowth as sets of practices along the food chain, this book will explore actual and possible degrowth projects in cities and towns that reduce energy and material consumption while re-valuing the social and environmental values and practices that make us human and sustain us. Following the publication of Housing for Degrowth, the planned Food for Degrowth book seeks to examine how food is experienced in and across the city, joining with other urban elements such as water, energy, waste, built form, mobility and planning. We propose a scholarly-activist book on food for degrowth exploring many environmental, social, political and economic issues. Contributions will interrogate existing models and potential alternatives. We plan to include diverse examples from villages and cities around the world that showcase exemplary food for degrowth practices, identify lessons from key experiments, and analyse and reflect on how we can vastly improve how urban food systems can be experienced and performed. – more ideas from you! – storage, waste and redistribution, such as re-using surplus food and compost. Would you like to contribute a chapter? From this initial call for contributions we will select proposals based on the relevance, strength and depth of the topic or theme and overall fit to the book project more broadly. Please feel free to contact us if you would like to discuss how your abstract would best suit this publication. We expect to decide on successful contributors by February with first drafts of 4000/5000 words due in at the end of May. Meanwhile, we co-editors will submit a proposal to a reputable publisher such as Routledge (Environmental Humanities series). A peer-review process will inform second draft revisions during 2019, with final drafts due in September. We are looking for contributions from social science researchers in any relevant disciplines and fields such as: environmental humanities, sociology, anthropology, geography, environmental studies, design, political ecology, permaculture and political economy. We encourage you to engage by email with us with any questions regarding the formation of your abstract. Other local courses during 2019 include gourmet mushroom cultivation, and introduction to permaculture.